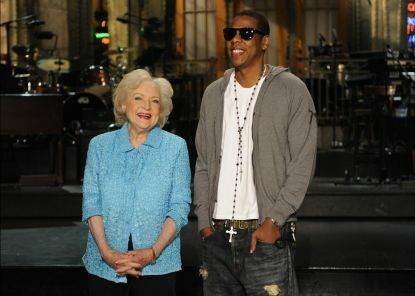 Betty White and Jay-Z were all smiles on the set of Saturday Night LIVE last weekend. 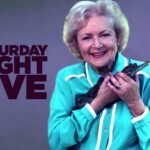 Betty White was asked to host the show legions of longtime fans signed a Facebook petition to get the 80-year-old “Golden Girls” star on the show. 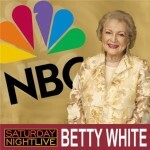 Betty’s hosting gig marked the 35th anniversary of the popular late night weekend comedy show and it’s said to be the most watched episode ever! “I really have to thank Facebook … I didn’t know what Facebook was, and now that I do know what it is, I have to say, it sounds like a huge waste of time. I would never say the people on it are losers, but that’s only because I’m polite. People say ‘But Betty, Facebook is a great way to connect with old friends.’ Well at my age, if I wanna connect with old friends, I need a Ouija Board.